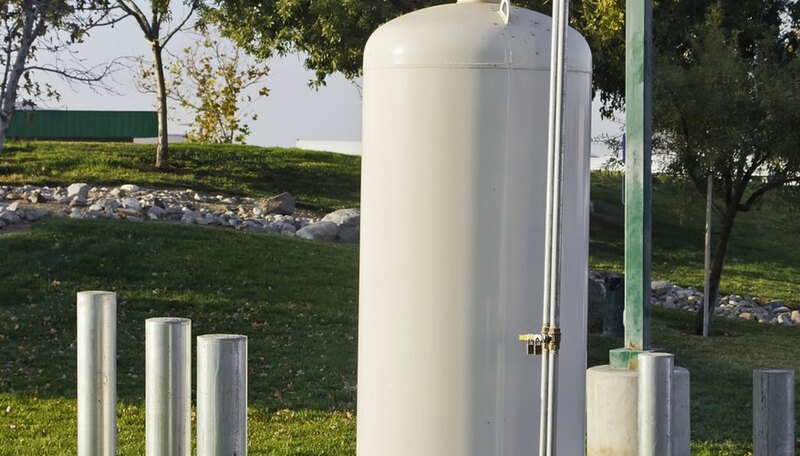 Although gas pressure is usually measured in units such as millimeters of mercury or pounds per square inch, in some instances equipment may read pressure as inches of a water column. In particular, liquefied petroleum gas pressure indicators use this form of measurement. Converting between these pressure units is a simple matter of multiplying by a constant factor; you only need to know what factor to apply for converting to and from water column inches. A standard four-function calculator helps make the conversion quick and accurate. Key the water column inches pressure reading into your calculator. For example, an LP gas tank outlet may read 20 inches. Enter 20 into the calculator. Use the fact that one inch of water in a water column is equal to 0.036 pounds per square inch of pressure; this is your conversion factor. Press the multiply key, then key in 0.036. Press the equals key to see the pressure as pounds. From the example, 20 times 0.036 equals 0.72, the pressure in pounds. Key the pounds pressure into your calculator to make the reverse conversion if you only know your pressure in pounds and want to figure out the water column inches. For example, your pressure gauge reads 2 pounds, so enter 2. Use the fact that 1 pound per square inch of pressure equals 27.78 inches in a water column; this is your conversion factor. Press the multiply key, then enter the number 27.78 into the calculator. Press the equals key to see the answer. In this example, 2 pounds of pressure times 27.78 equals 55.56 inches of water in a water column. Note that pressure in pounds for LP gas tanks is the gauge pressure, not the absolute pressure. Gauge pressure uses atmospheric pressure (14.7 pounds per square inch) as a baseline, so 5 pounds is 14.7 + 5 = 19.7 pounds per square inch of absolute pressure at sea level. Papiewski, John. "How to Convert a Water Column to Pounds of Pressure." Sciencing, https://sciencing.com/convert-water-column-pounds-pressure-5666070.html. 24 April 2017.